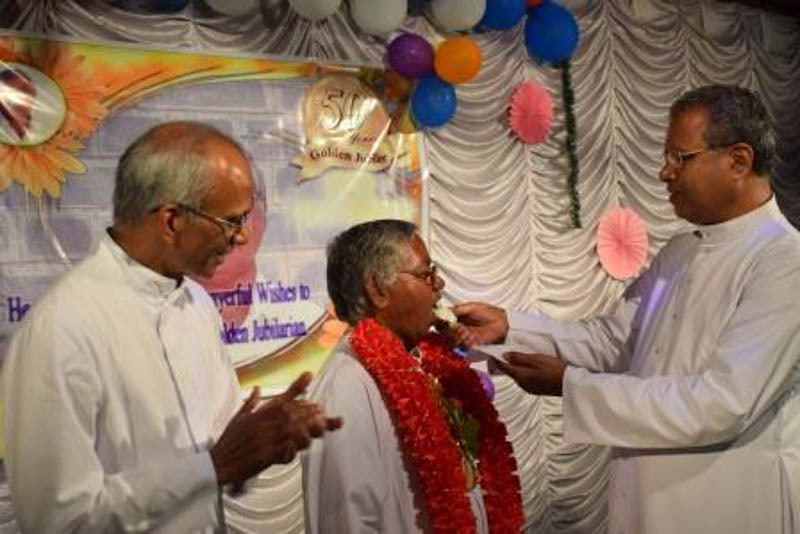 These pre-Christmas celebrations were in aid of the Fr. Ferrero Foundation. Proceeds from this event, will be sent to the foundation. The Fr. 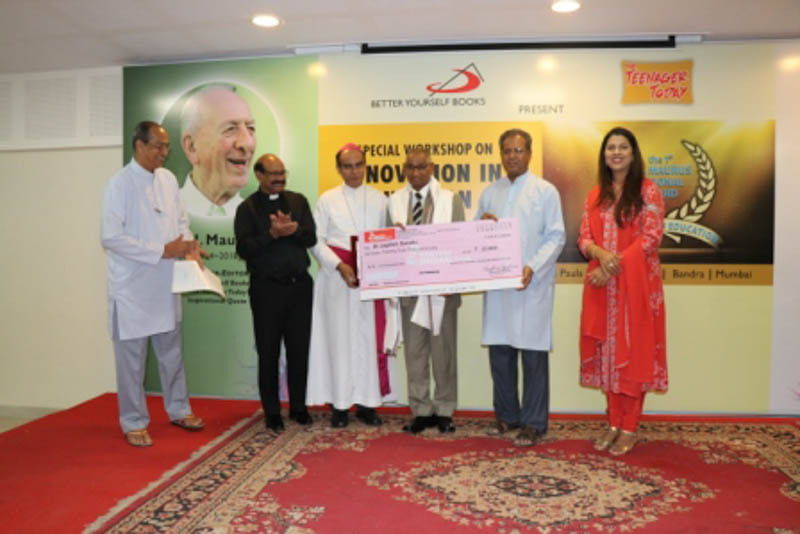 Ferrero Foundation, launched in the memory of Fr. 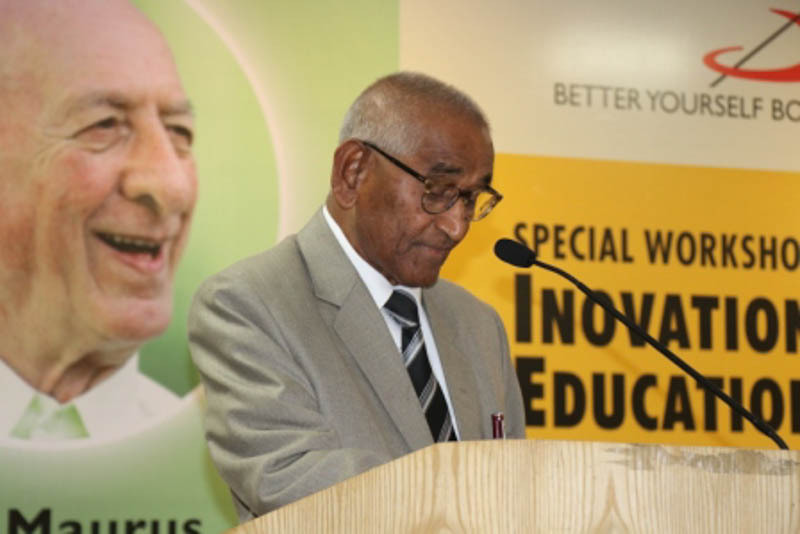 B. Ferrero, the founder of SSP in India, provides educational relief to the poor, medical aid and other social aids helping the needy sections to live a healthy life. Donations made to the Trust are eligible for exemption under section 80-G of the Income Tax act. 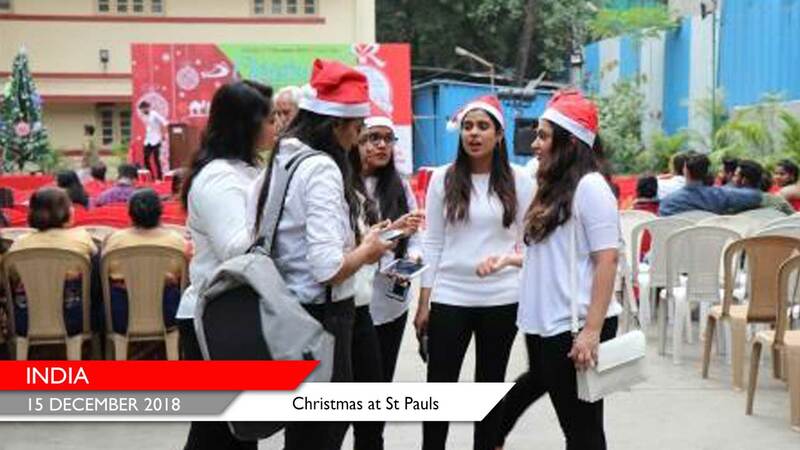 The morning of Saturday, 15th Decembers, witnessed the first ever Christmas Bazar at St Pauls. The bazar offered festive discounts at the popular St Paul Book and Art Centre. NGO’s Alive, Arambh, who sold products made by their beneficiaries were a big hit with all visitors; Towel Kingdom, Delightful Indulgence Eats were also amongst the other popular stalls. The spectacular Christmas at St Pauls: Choirs. Carols. Communities. 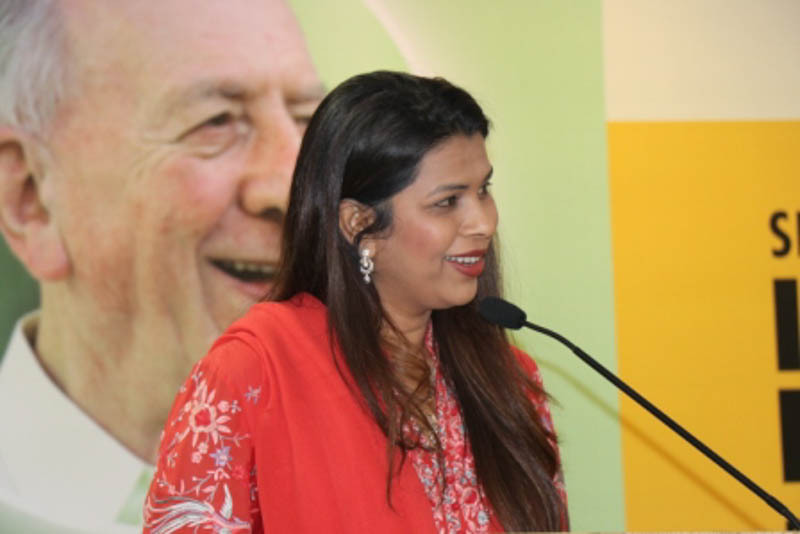 Celebrations started sharp at 5.00pm, with a carol singing performance by the effervescent ‘Happy Bunch’ children’s choir, led by Sarita Manchanda. Fr. 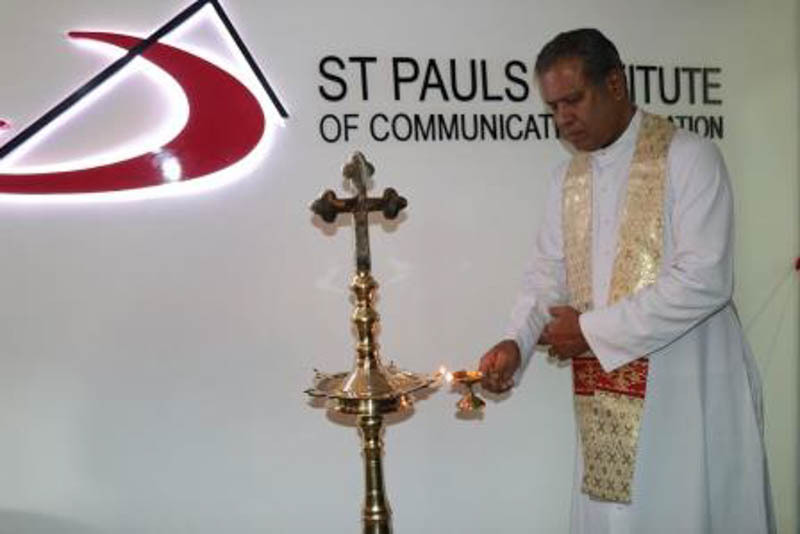 Dominic, Director – St Pauls Institute, welcomed the Chief & Honored Guests, audience members and participants to partake in a community centric Christmas this year. He spoke about his thoughts encouraging community celebrations, ‘Christmas’ as a Gift for all, the Fr. 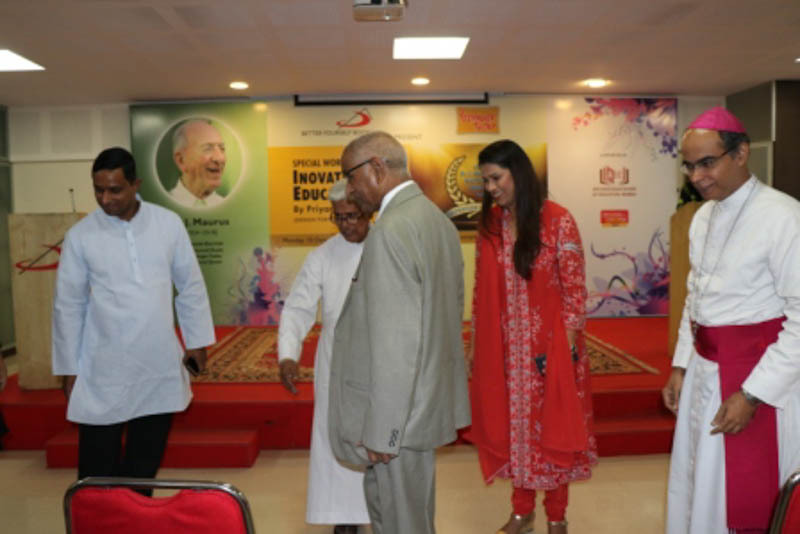 Ferrero Foundation and shared his vision and aspirations, that this fest becomes as grand and popular as Celebrate Bandra fest. Rev. 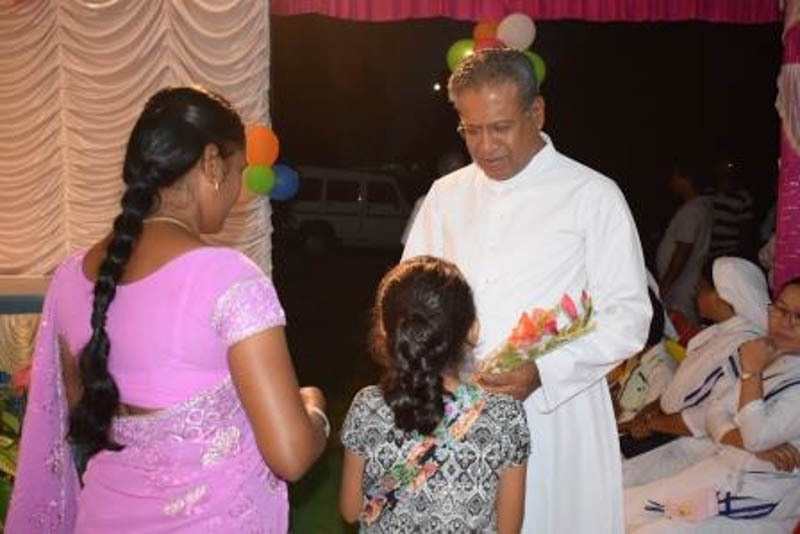 Fr Varghese Gnalian, the Provincial Superior, delivered the Christmas message and invited the gathering to share the joy of Christmas with their very life, by giving the spirit of Christmas with others. We were glad to have in attendance, Mr. Ashish Shelar MLA, Bandra (W) & President- Mumbai BJP; presiding over the evening as the Chief Guest, lighting the Christmas Tree, and sharing his message for Bandra particularly at Christmas Time; Mr. Girish Anavkar, Senior PI at the Bandra West Police Station, endeared himself to the crowd, as he spoke about his humble beginnings, the importance of education, his plans to contribute to Bandra and society at large. 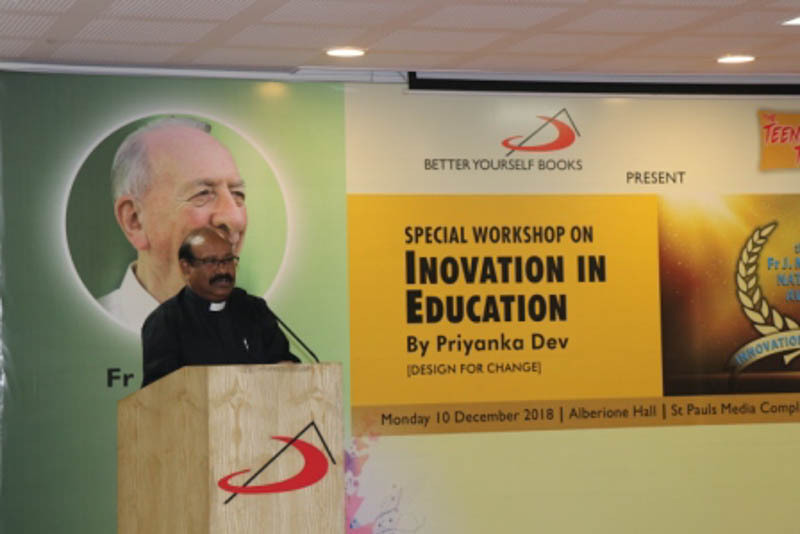 Popular Hindi Film actor, Ms. Kareena Kapoor, took time of her busy schedule and graced us with her presence; as did Dr. S Pinto- Director, Ryan Int’l Group of Schools. 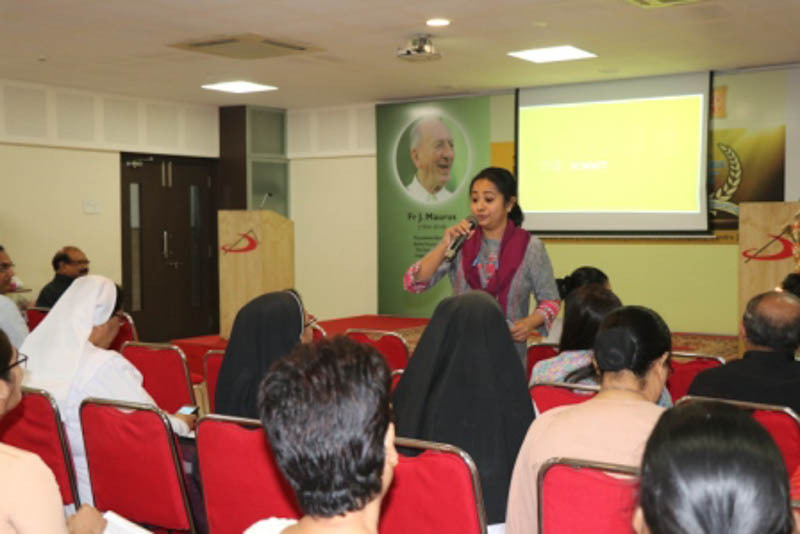 The celebrations continued, with melodious rendition of a medley of carols, led by Sr. Anna and the Daughters of St Paul’s Christmas Joy carolers. 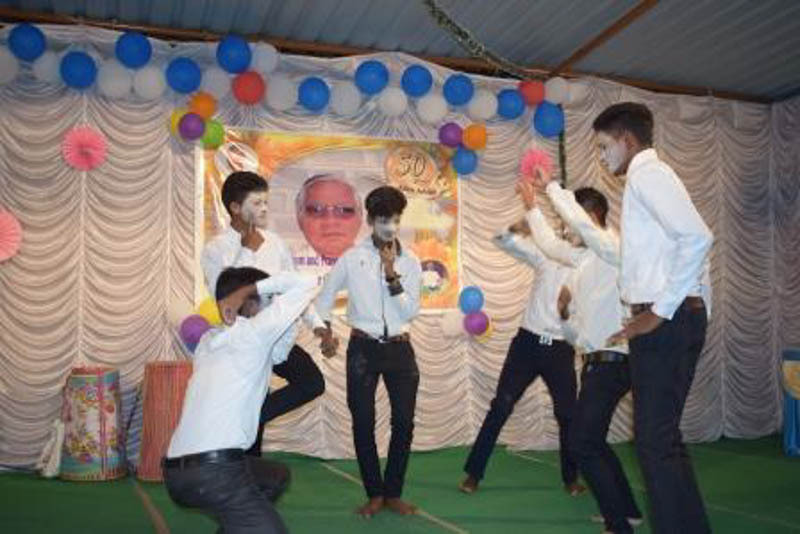 The PG students of the Institute, accompanied by their Course Directors, also put on a lively performance. Saving the best for the last, let the audience enjoy the beautiful sounds of the 20 voice Church at Powai Christmas choir led by Rev. Dr. C. Clements. 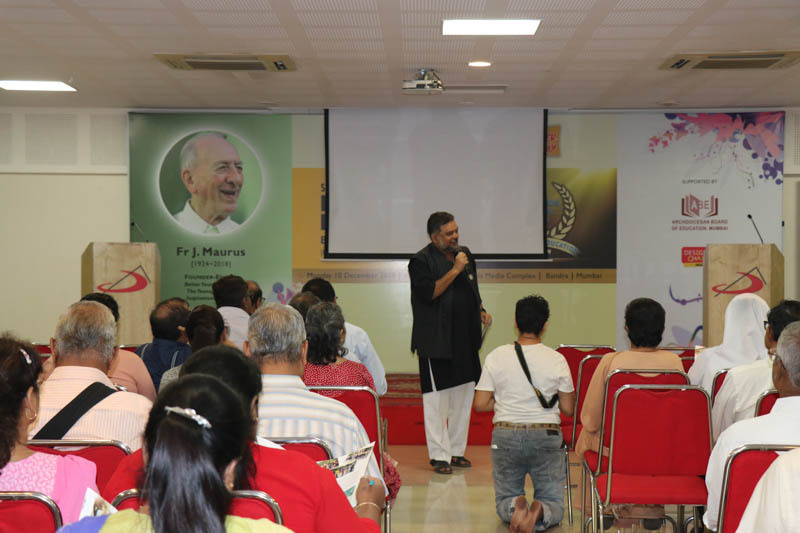 The evening witnessed the release of a Hindi Devotional musical album’ God’s Love’ by St Pauls India. By sundown, lucky winners took home prizes for their participation in Christmas Draw –in aid of the Fr.Ferrero Foundation. A neighborhood that celebrates together stays together. Keeping the promise made to all the children in the audience, Santa Claus made a grand entry, met with little children and the audience, while distributing candies to everyone in the audience. The evening came to a close, encouraging everyone to look at Christmas in a new way this year. 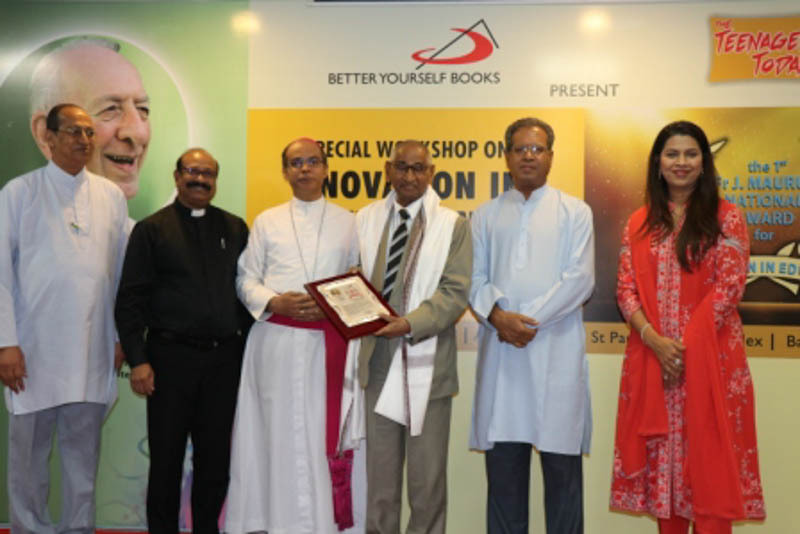 Fr J. Maurus National Award for Innovation in Education was conferred Dr Jagdish Gandhi, Founder-Manager of City Montessori School, Lucknow, at Mumbai on 10 December 2018. 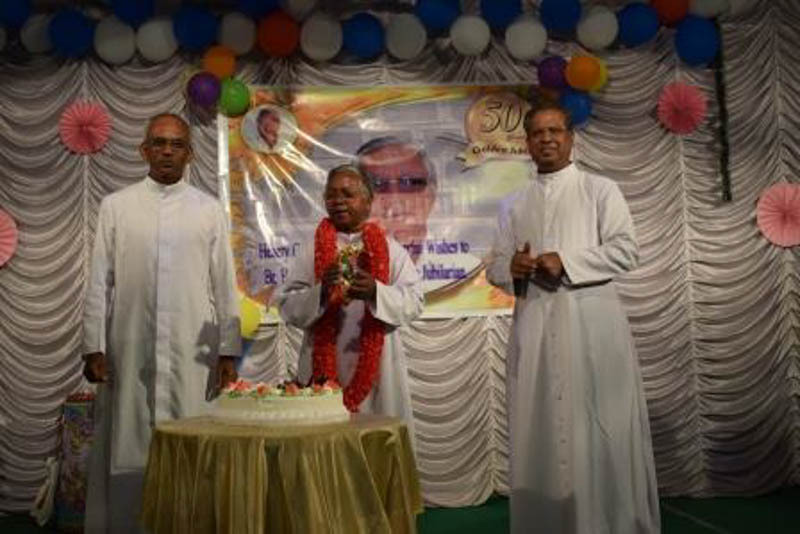 The Award was instituted by the Society of St Paul on the occasion of the 55th Birth Anniversary of The Teenager Today, founded by Fr J.Maurus in November 1963. 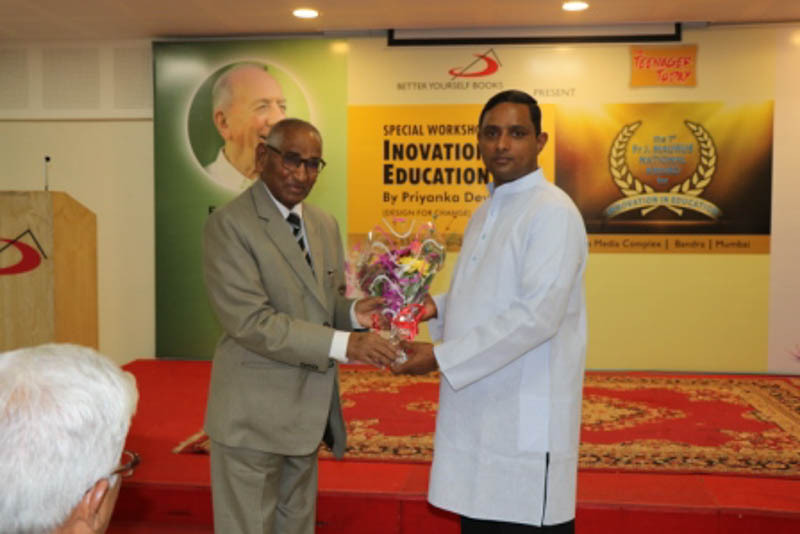 The Award consists of Rs 25,000/- in cash, and a citation. 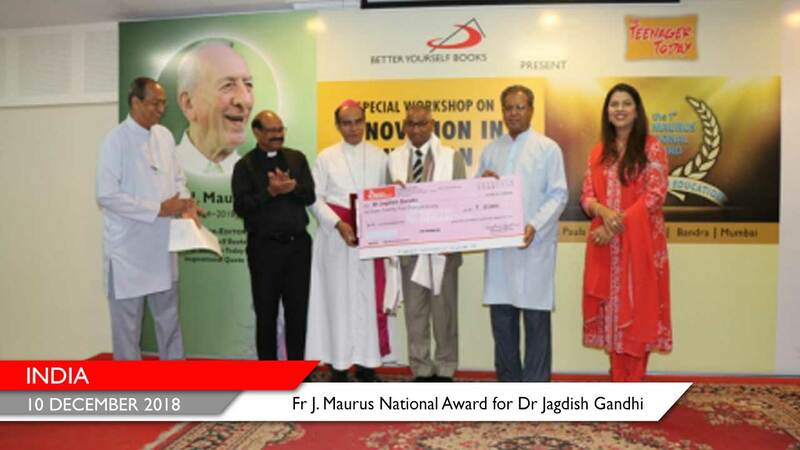 The Award was jointly presented to Dr Gandhi by Most Rev. 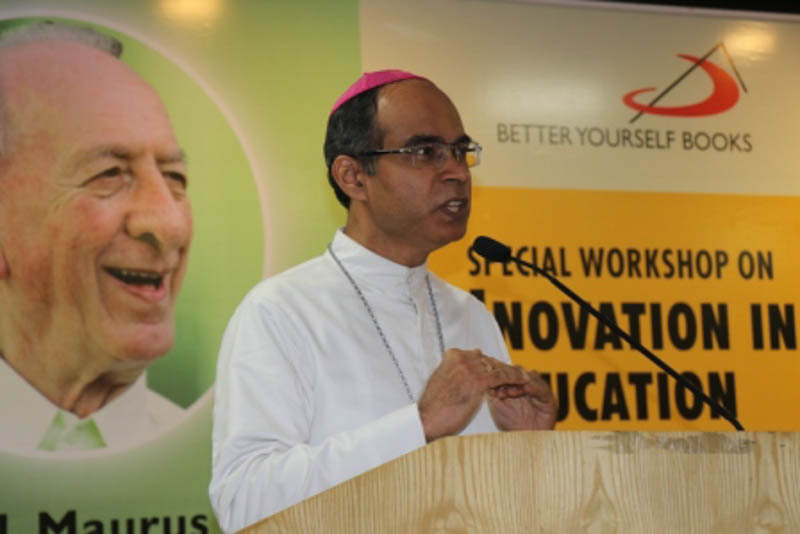 John Rodrigues, Auxiliary Bishop of the Archdiocese of Bombay, Rev. 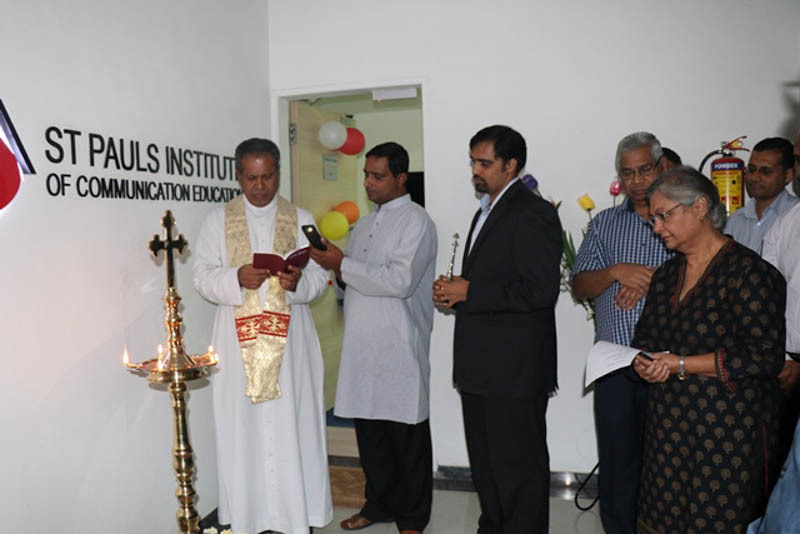 Fr Varghese Gnalian, the Provincial Superior, and Dr Snehal Pinto, Director, Ryan International Group of Institutions, Mumbai. Greatly influenced by Mahatma Gandhi and Vinoba Bhave, Dr Gandhi ventured in 1959 to create a new mindset in children through education. With just five children on rolls, no personal wealth, and with only the equivalent of $10 borrowed from someone, he began his own personal experiment, naming it City Montessori School. Since 1999, City Montessori School has held the Guinness World Record for the largest school with over 56,000 students on its rolls. Since 2001, he has also been convening the International Conference of the Chief Justices of the World to create awareness and mobilise the World Judiciary to create a world safe for the children of the world. He saw education as a more powerful vehicle to prevent conflicts than working with negotiations and policy efforts. He strongly believes that children are the world’s future, and the best way to mould the future is to mould children. Despite the fact that he heads the world’s largest school, Dr Gandhi still lives in the same room where he began his work for peace in 1959. He has chosen to have no personal wealth of his own, spending instead all his created resources on his mission. 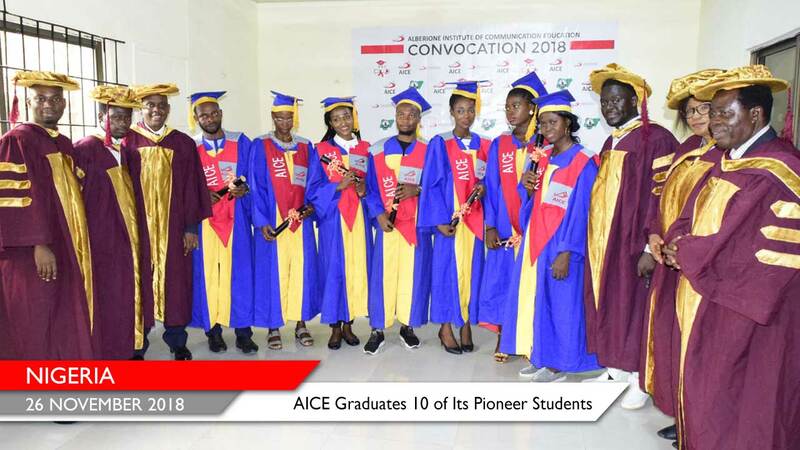 It was a historic day on Monday, 26 November 2018, which also fell on the feast day of our founder, Blessed James Alberione, when 10 of the pioneer students of Alberione Institute of Communication Education (AICE), Iju-Lagos came out from the institute in flying colours, accompanied by their parents, guardians and well-wishers, to receive their certificates having successfully completed their training programmes and passed the prescribed examination. 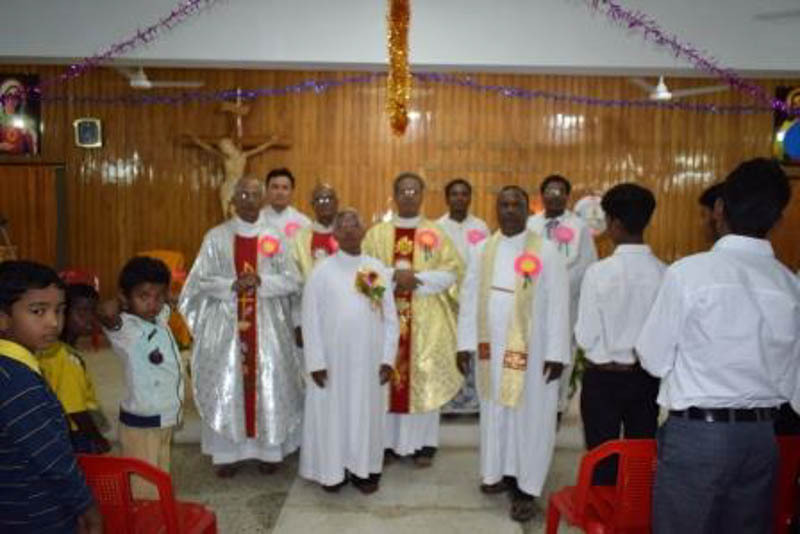 The event began with Mass celebrated by Rt. 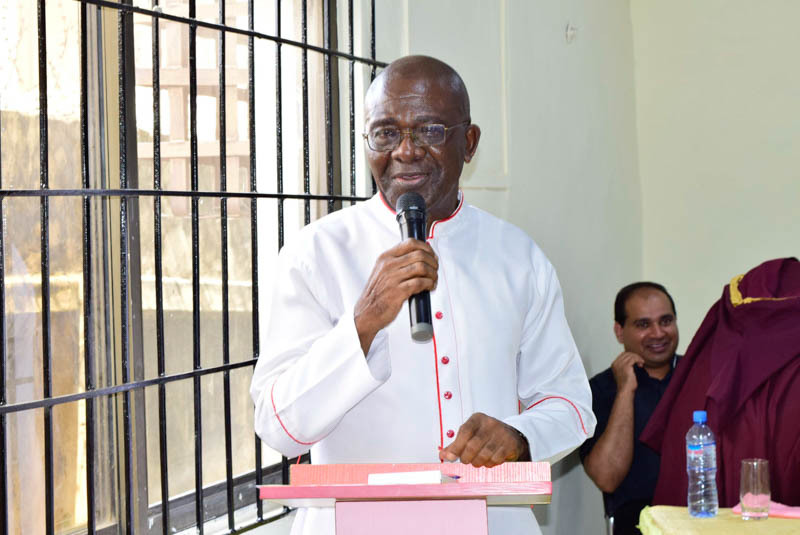 Rev Mons John Aniagwu, Episcopal vicar of the Archdiocese of Lagos who represented Rt Rev Dr Alfred Aldewale Martin Archbishop of Lagos. The homilist, Fr Joe Eruppakkatt, General editor and a faculty member, extolled the virtues of the founder Blessed James Alberione and exposed how God used him for the specific apostolate in the Church to spread the Gospel message and values through the mass media and other forms of social communications. 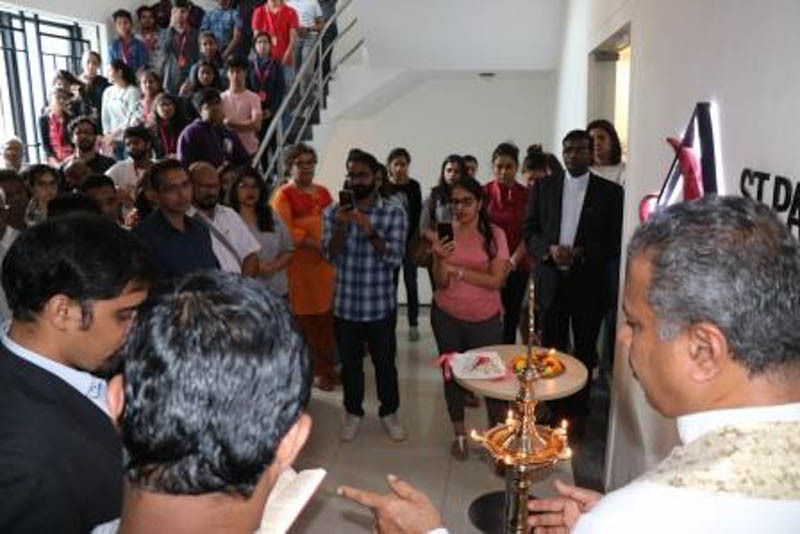 Soon after the Mass, everybody moved to the institute for the convocation and the blessing of the newly added facilities. 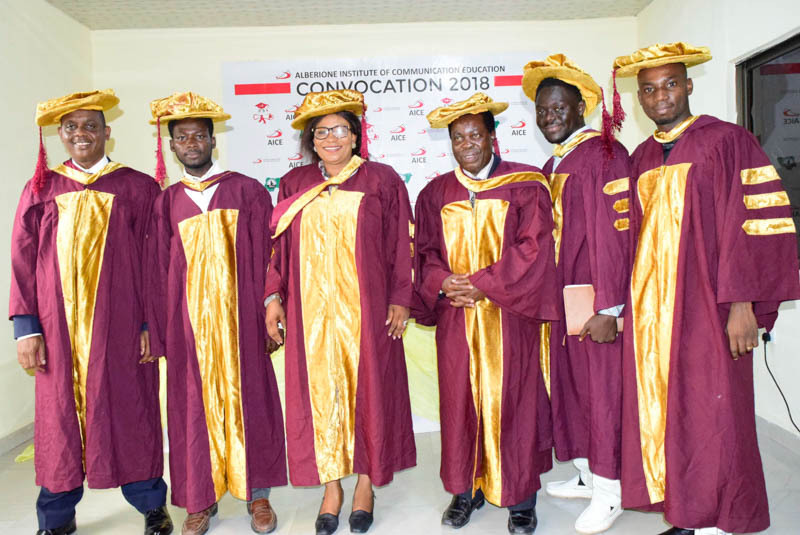 The convocation ceremony was held at the newly constructed Multi-purpose hall of the Institute. 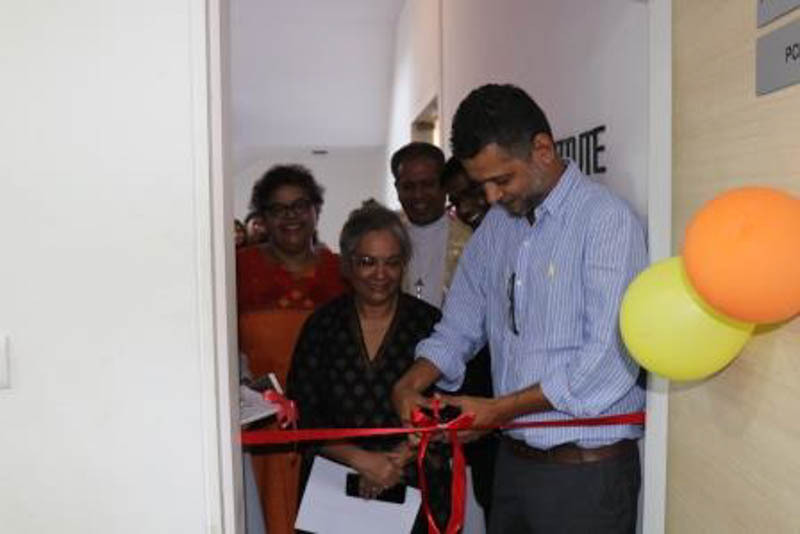 In his opening remarks, the director of the Institute, Fr. 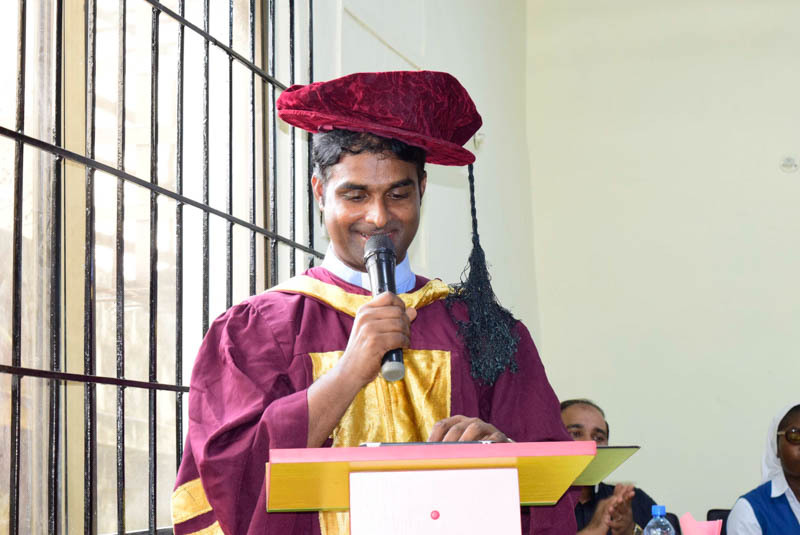 Jikson Mullasseril welcomed all the dignitaries and congratulated the graduates who he described as pioneering students of the media institute. 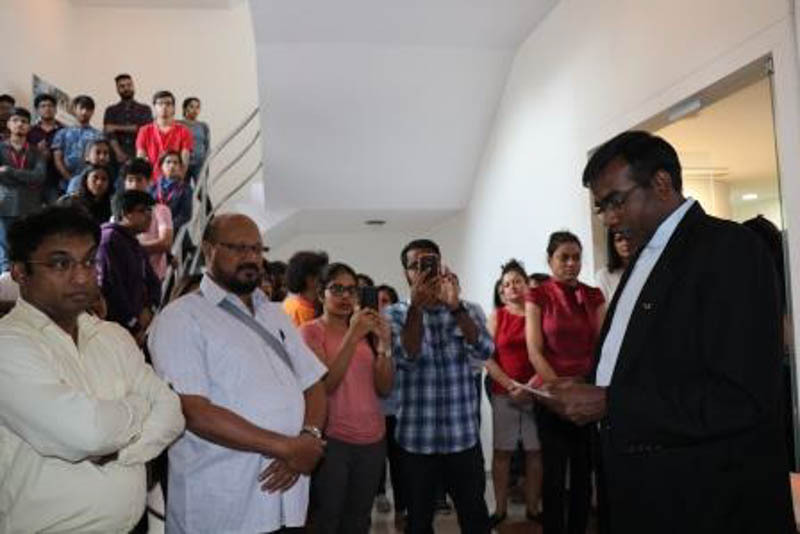 He emphasized in his address on the vision and mission of the institute and also appealed to the youth to choose AICE to pursue their professional media studies. 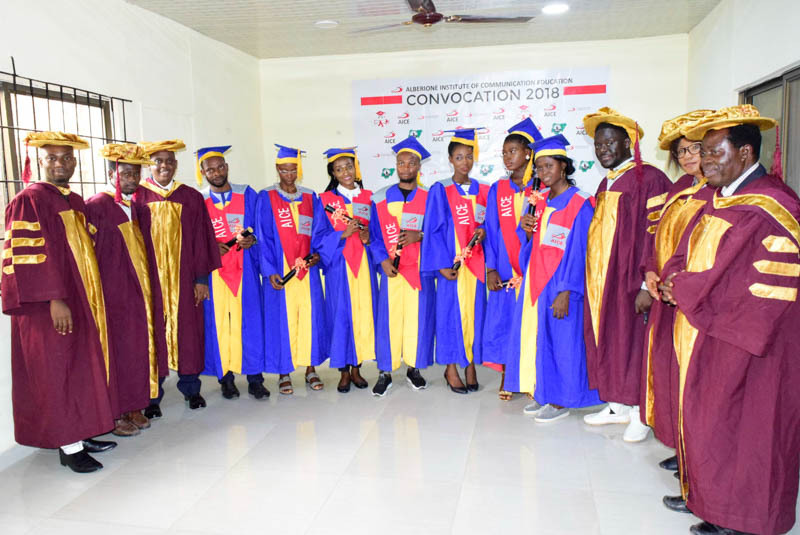 He assured all of them that they will not only be empowered with the tools for a thrilling career in media, but also learn the fine art of value based, socially conscious and responsible media personnel. 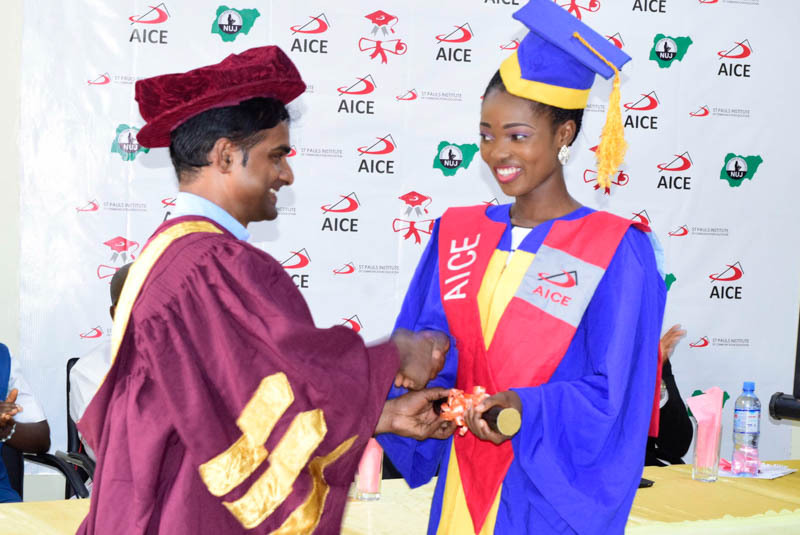 Fr Siji Jose, the coordinator of the Apostolate in Nigeria stressed in his address the importance of education and how important it is to pursue it at AICE. 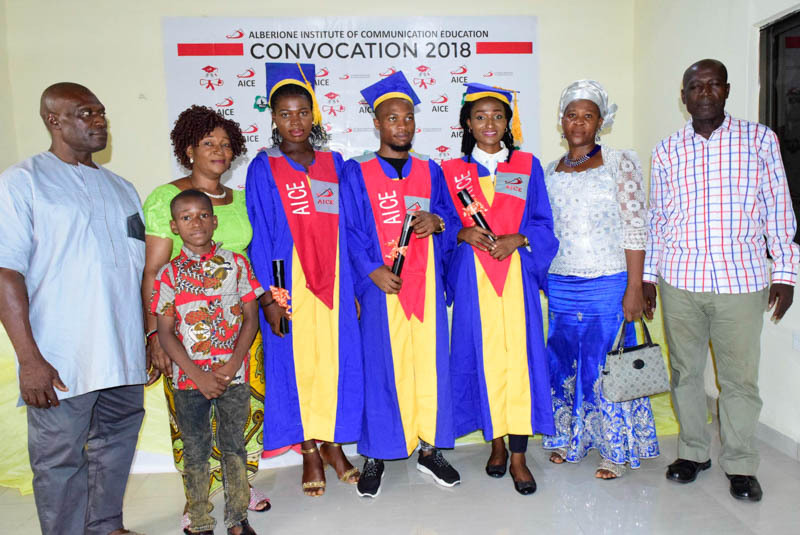 The chairman of the occasion, Dr. Okafor, focused that education is key to human development and called on parents to ensure that their children acquire one skill or the other for the good of the society. 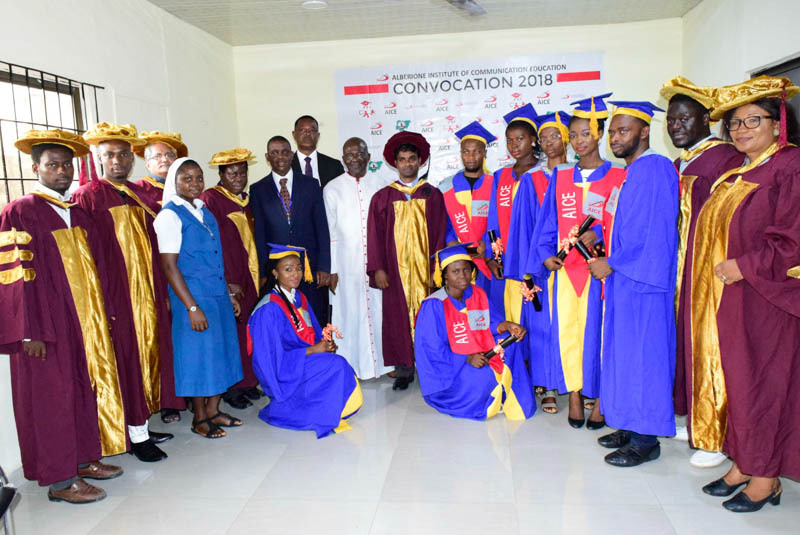 The high point of the convocation was the blessing and the cutting of the tape to formally open the Institute's multi-purpose hall, new classrooms, and a brand new multi-purpose studio, christened Psalm 100 Broadcasting Studio by the Episcopal Vicar General, Rt. Very Mons. John Aniagwu. 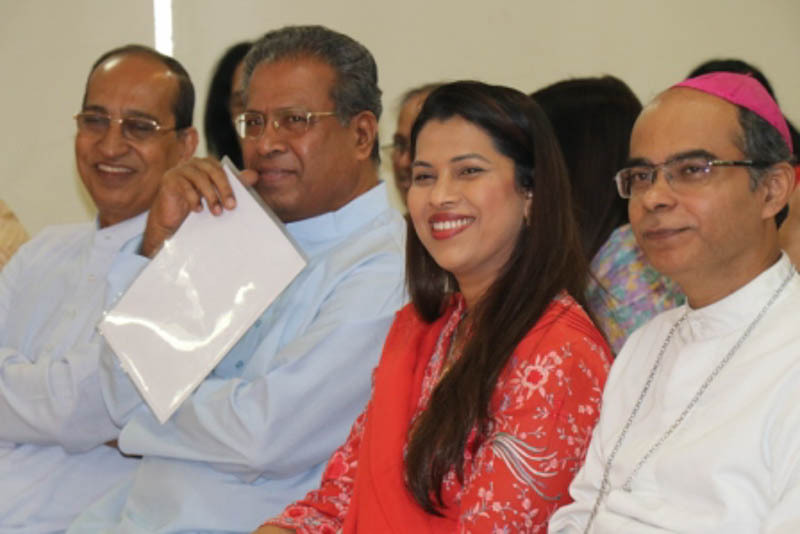 Speaking shortly after the award of certificates to the deserving graduates of the Institute, Mons. 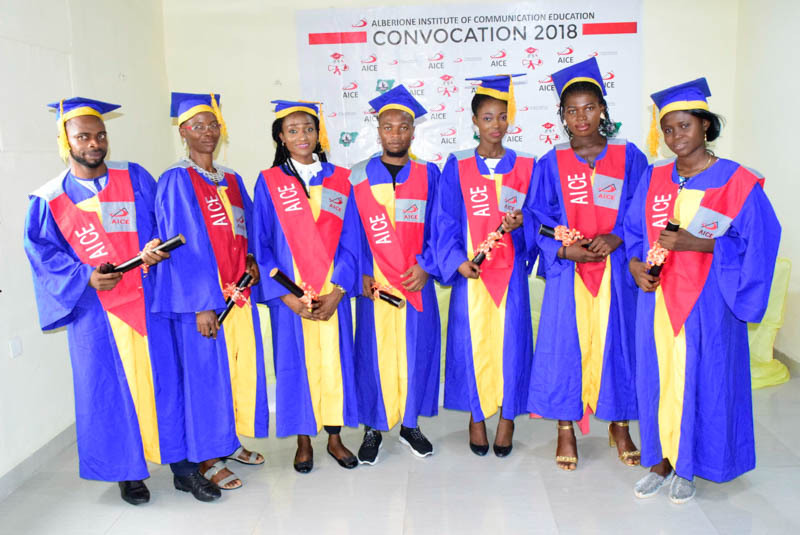 Aniagwu praised the management of the Institute for providing modern equipment and facilities , especially the new broadcasting studio not only to enhance training but to benefit society. 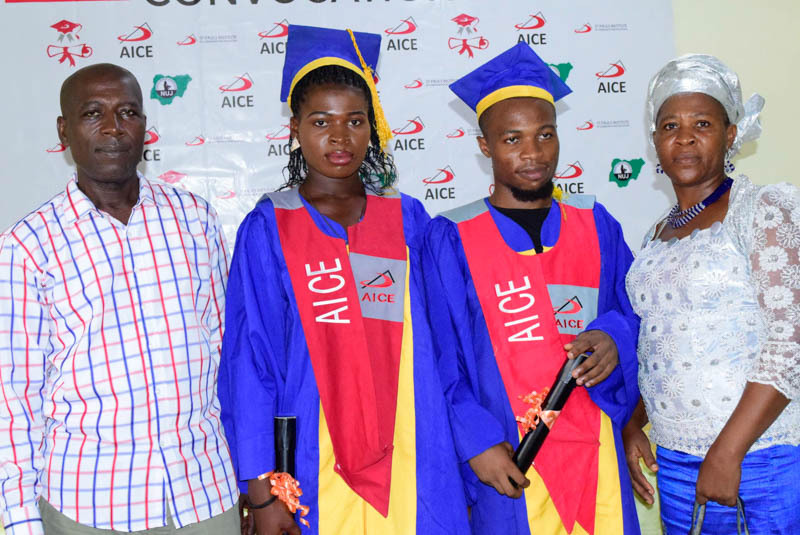 He said AICE is a clear testimony of a dream come true and encouraged parents, adults and youths to take advantage of what he called the miracle of Iju-Lagos and proudly hosted by the Lagos Archdiocese to acquire skills in journalism, creative writing and other technical aspects of media training and become useful to themselves, the Church and the larger society. 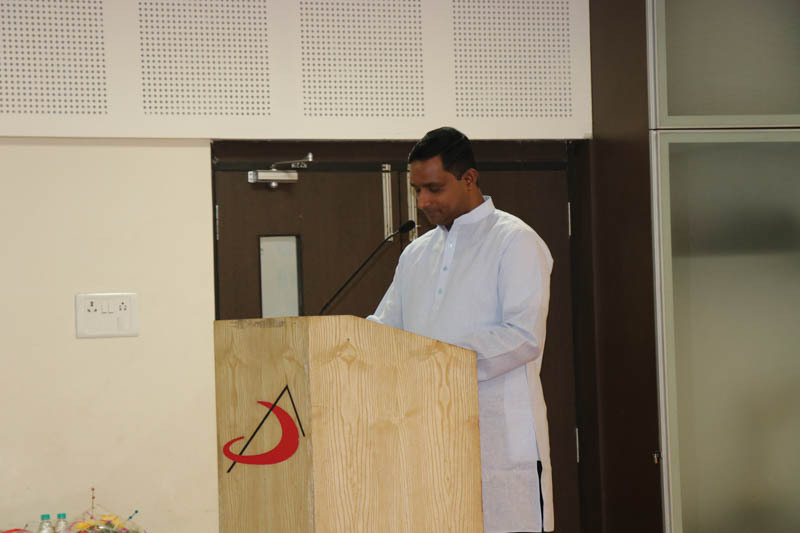 The vote of thanks was given by Rev. Fr. Gerard Tanko, SSP who appreciated all who turned out to witness the history making event. 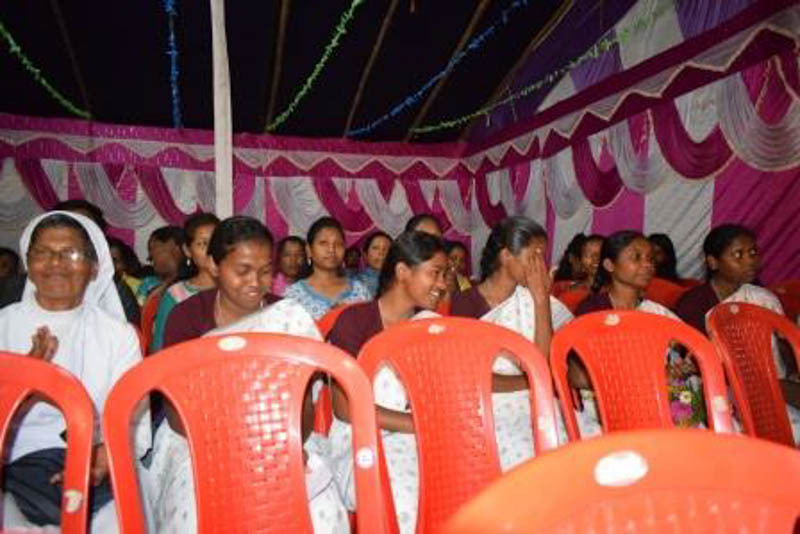 The programme ended with refreshment for all. 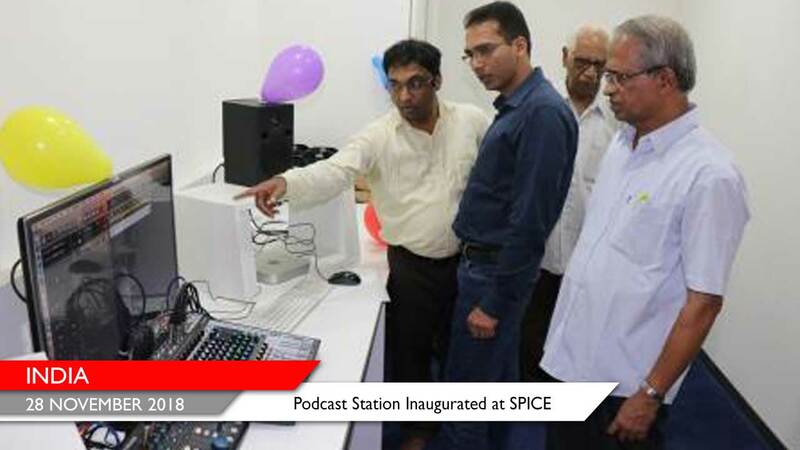 St Pauls Institute of Communication Education (SPICE) formally inaugurated its podcast studio on November 28, making it possibly the first media school in the country and certainly in Mumbai, to have such a facility. 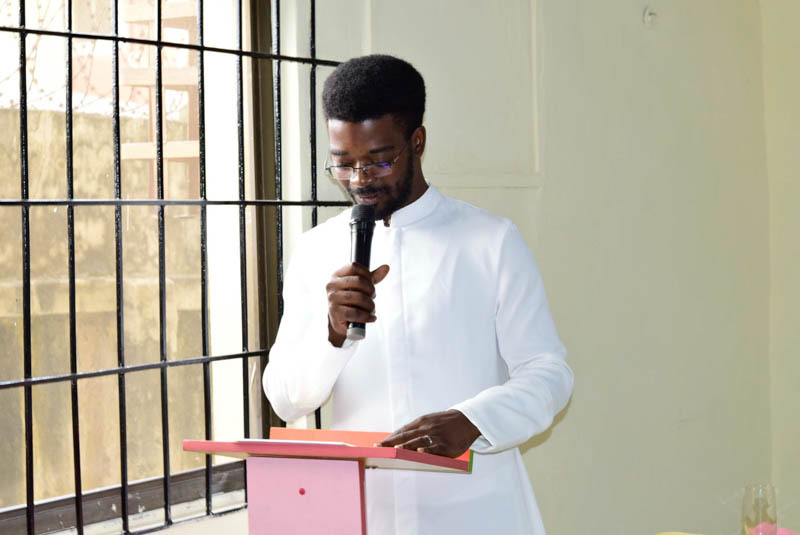 The blessing was carried out by Rev. 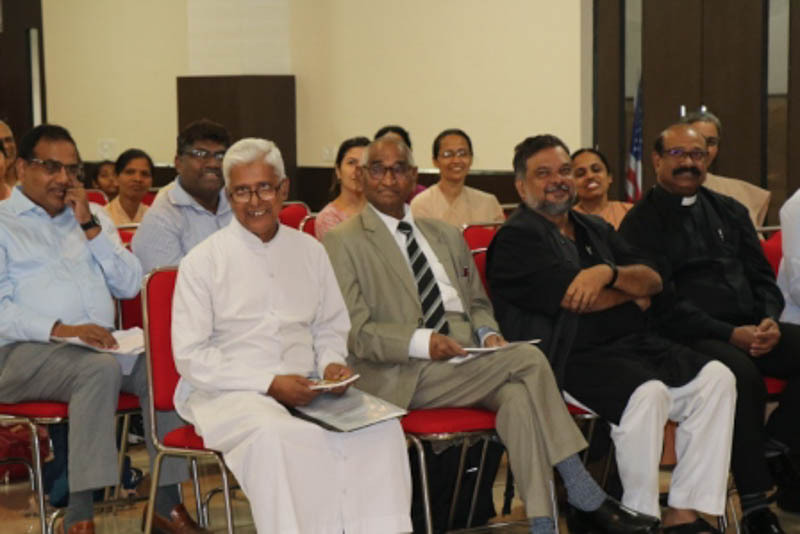 Fr Varghese Gnalian, Provincial Superior, Society of St Paul, India, with Fr Sebastian E., Director General of the Apostolate and others in attendance. 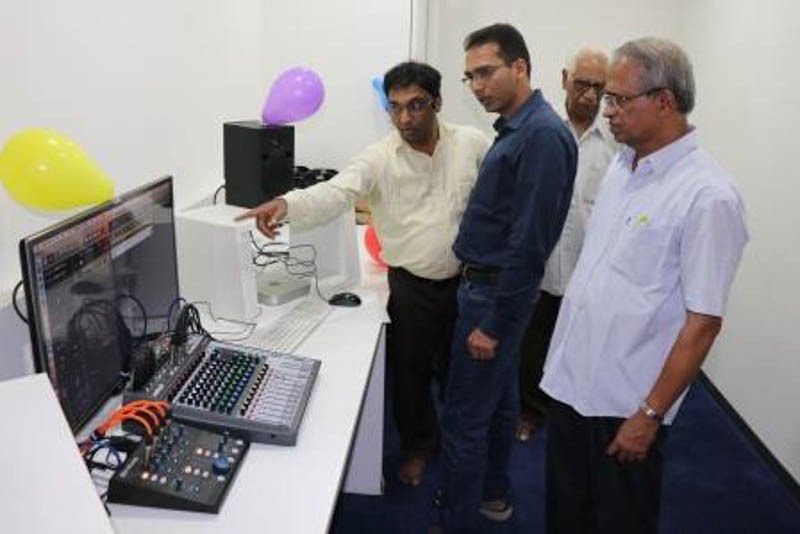 Fr Anil C Paul, SVD, who teaches and anchors the podcast module, was on hand to showcase some student work. 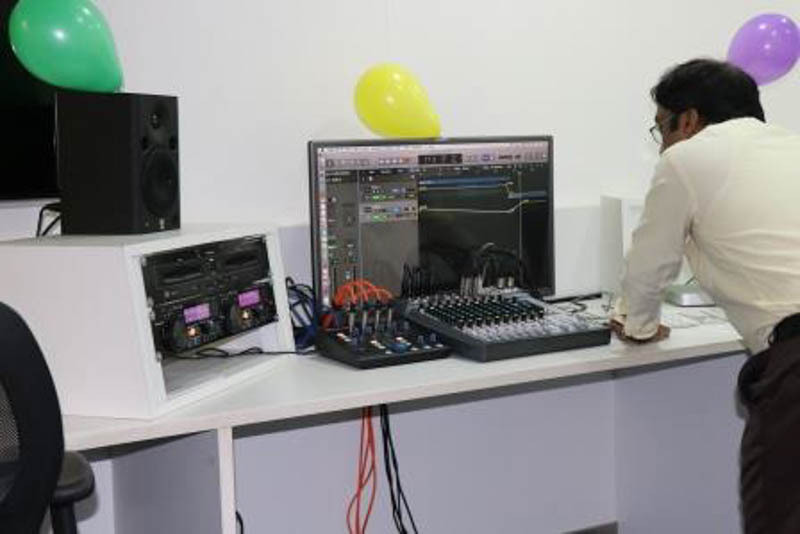 Rajesh Tahil, co-founder of Audiomatic.in, arguably India’s first and best podcast network, inaugurated the studio and later addressed the students on the subject of podcasts or internet radio. 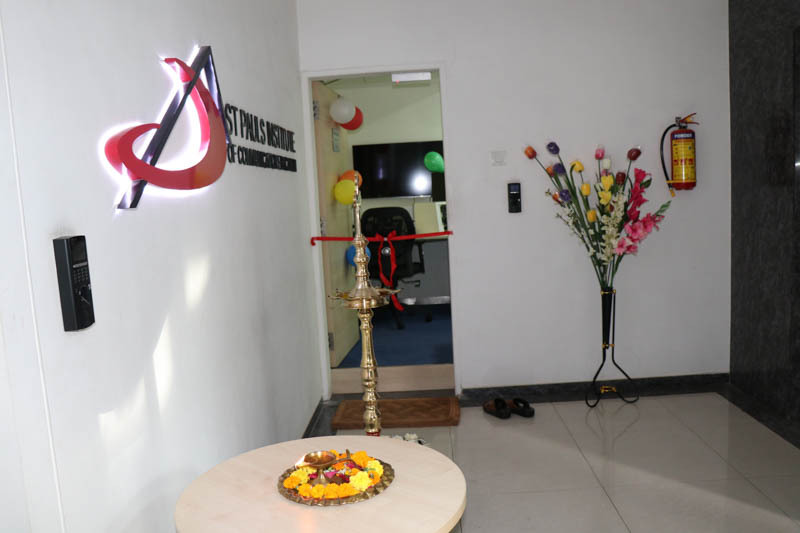 During his address, which was accompanied by a presentation of podcasts from audiomatic.in, Mr. Tahil spoke of the immense potential of audio and its role in media. 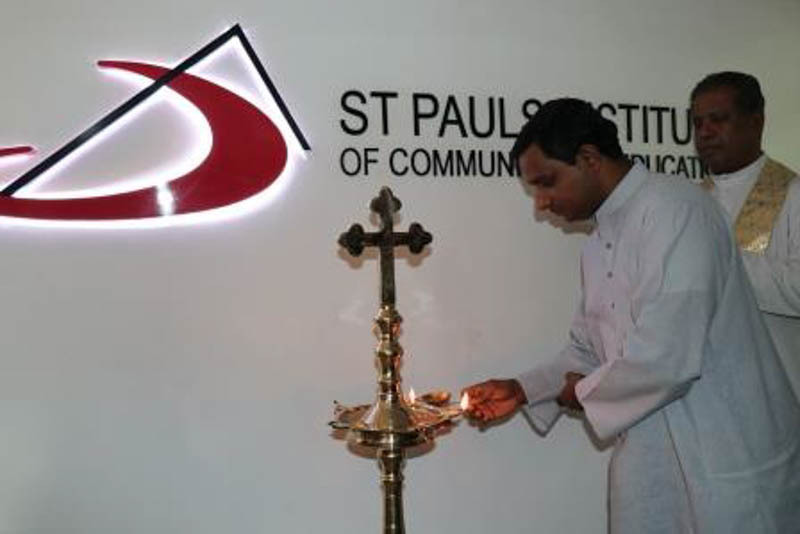 “I am thrilled to be part of this event, and I congratulate St Pauls Institute of being ahead of the competition.’ He added that very few media schools can boast of a podcast module on its curriculum, and even fewer would set up a proper facility to enable students to master yet another arm of the media ecosystem. 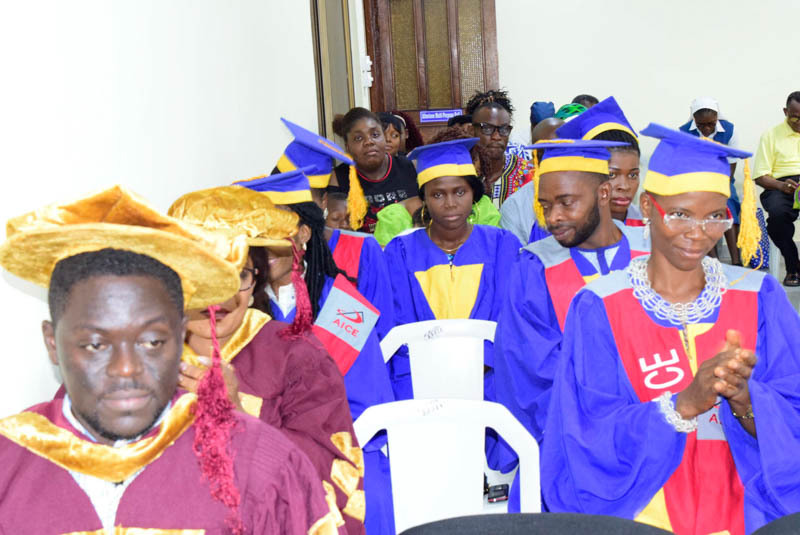 On their part, the students listened attentively to what he had to say and then asked questions pertaining both to teaching of the module and trends within the field. 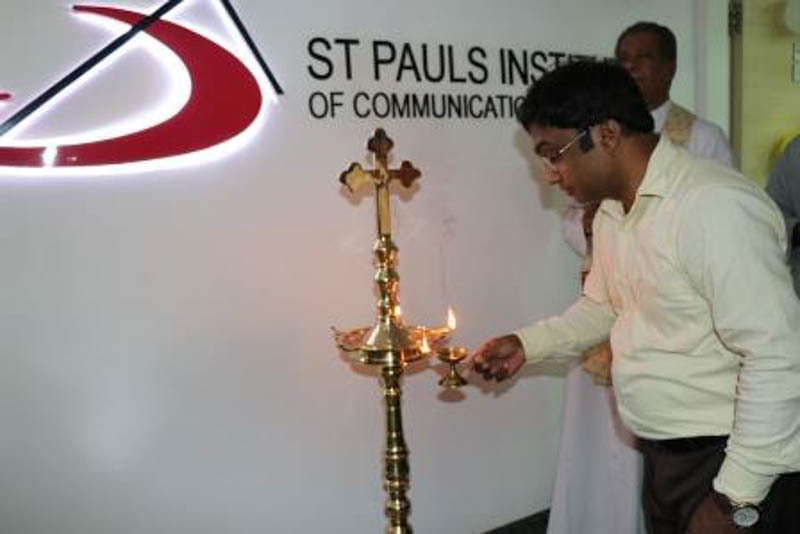 St Pauls Institute now has both television and audio facilities aimed at ensuring its students, particularly those undertaking its Post Graduate courses in Journalism, Advertising and Public Relations, go into the work place armed with an awareness of industry practices, in keeping with its promise to work with professionals at every level in delivering practical training as well as technical knowhow, while developing content that matches industry needs and standards. 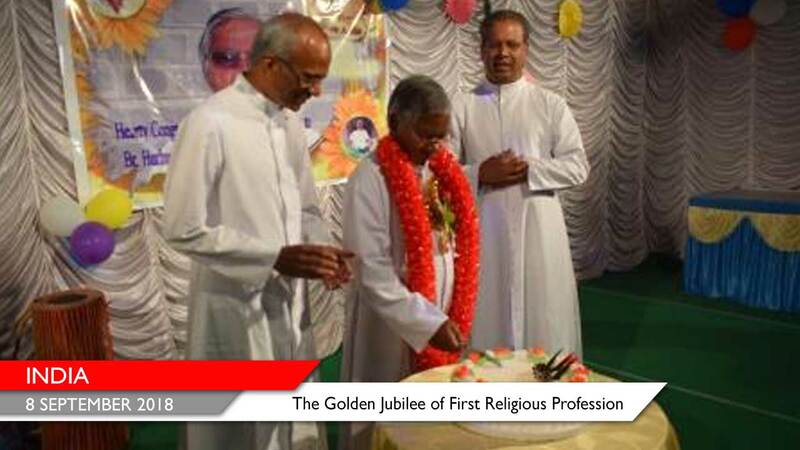 The ‘Golden Jubilee’ of Br William Hurhuria was celebrated on 8 September 2018, on the feast of the nativity of our Blessed Mother Mary. 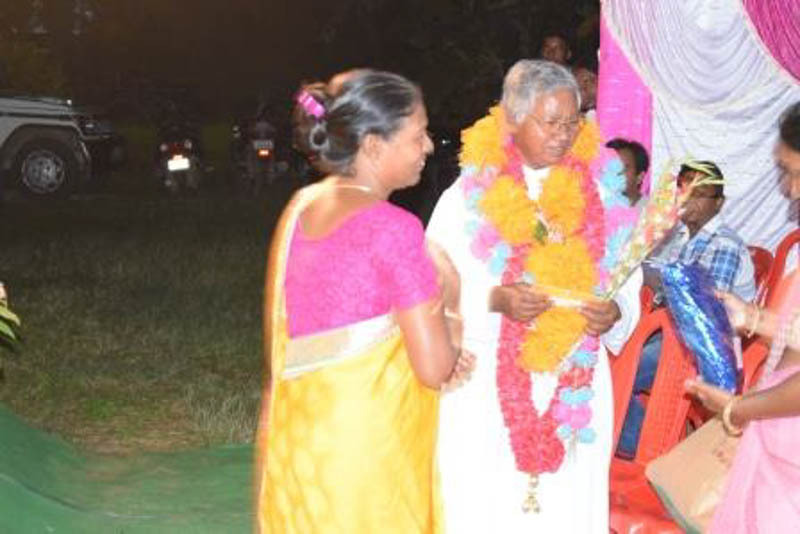 The Community of Ranchi spent several days in preparing themselves for the Holy Eucharist and the cultural programme. 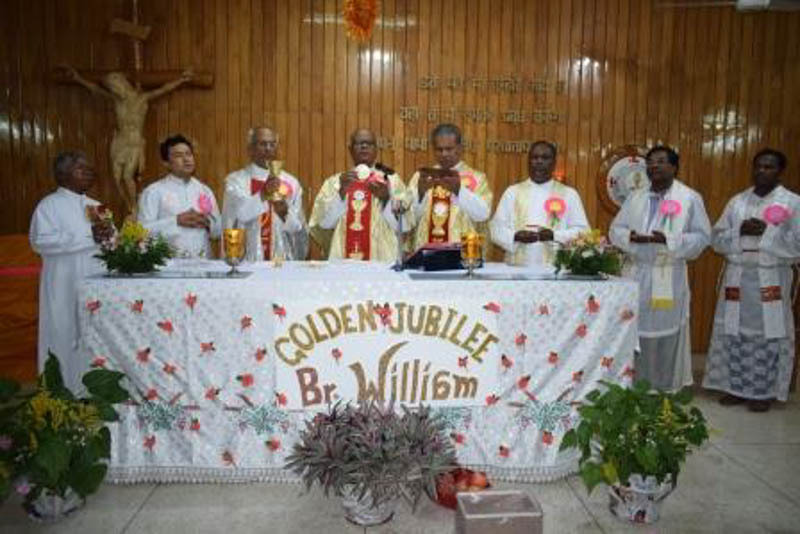 The Eucharistic celebration was presided over by Rev Fr Varghese Gnalian, our Provincial Superior at 5 O’clock in the evening. 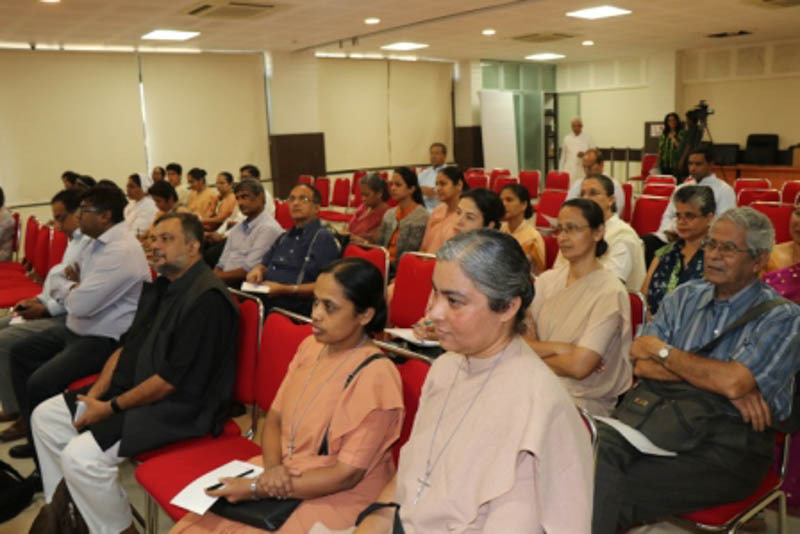 Rev Fr Hubertus Beck, Parish Priest of Hulhundu, Ranchi , was one of the prominent invitees. 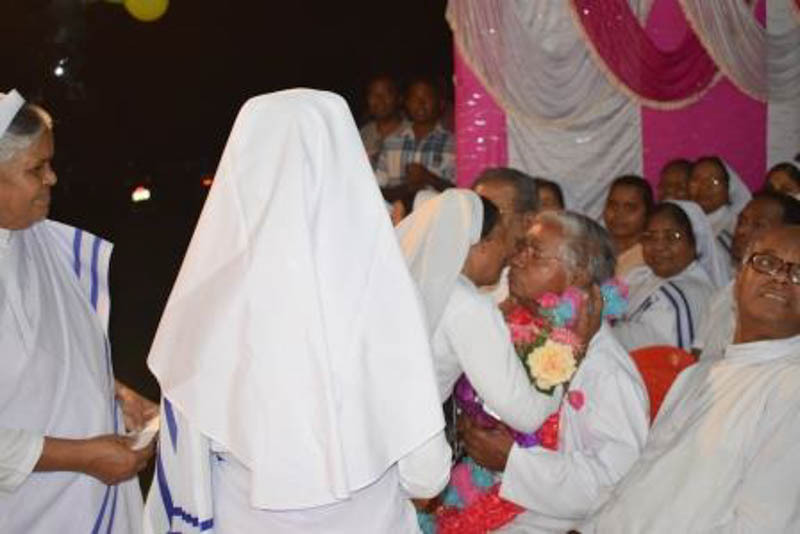 After the Mass the Community of Ranchi as well as the guests felicitated Br William. 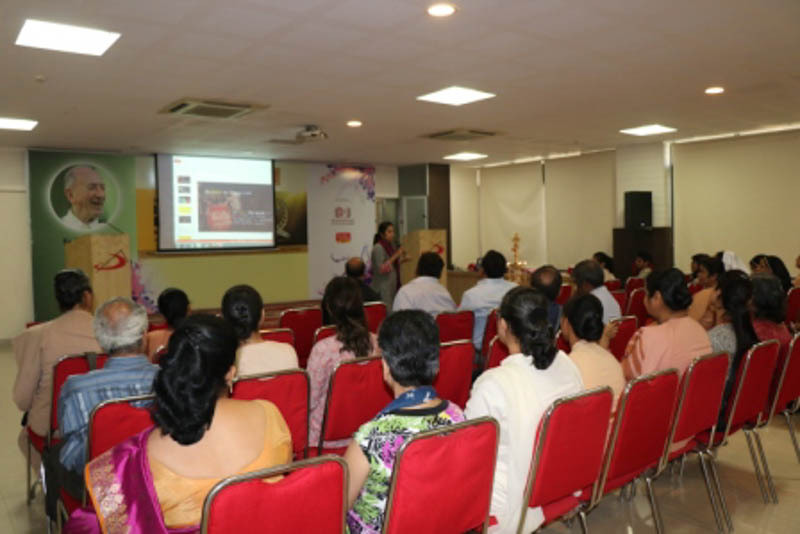 The day was marked by a tastefully prepared cultural programme. 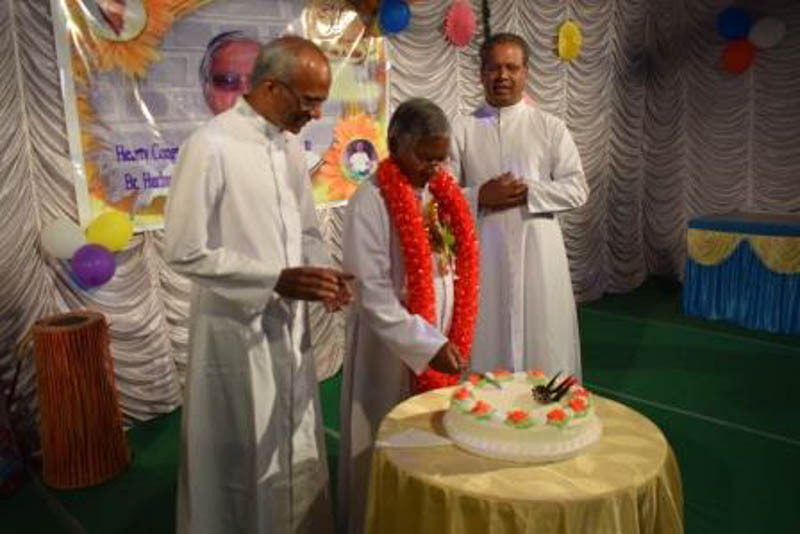 Br William was full of praise and thanks to God, to the community and all the guests.